Gosick is one huge rollercoaster ride from start to finish. A really well told story of a boy that meets a mysterious girl in a library which she has incredible knowledge and perceptive powers. Thus, the two becomes friends and they start to solve cases of the weird and unexplainable. I have not be so captivated by an anime right from the start to finish for a while now. Gosick manages to do that right from the first episode, throwing the audience into a murder mystery of the Queen Berry case. Thus, this starts a whole chain of events for Kujo, as he becomes friends with the mysterious Victorique. The mysteries were great and kept be wondering to the very end of the episode. The interlinking between episodes was fluent and kept at the same pace. Each case had its own unique story behind it and different circumstances. When each case is solved, you will definitely say "Oh, I see." out load. 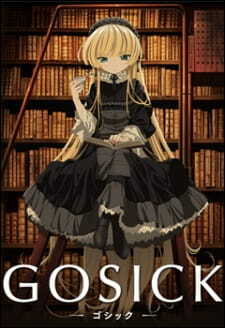 Gosick lightly touches on romance and just a drop of comedy is evident here and there. Note that the anime does contain a bit of goriness and can get a bit creepy. Nothing you can't handle if you watched something like Ga-Rei: Zero, Ghost in the Shell or similar. The art was excellent in this anime! The characters were all unique and the scenery were beautiful. Even the change in environment stood out in each episode. The many places the duo visit had their own unique characteristics such as a different tone of colour, objects around them and physical buildings. Victorique is cute as always with her ever frilly clothes and Kujo just looks cool in his trousers and hat. Let me tell you about the music in this anime. The theme songs were really catchy and memorable. I loved every bit of music in this anime. Somehow, it suited the theme and genre perfectly for this anime. Aside from the theme songs, the voice acting was also perfect. Victorique with a cute voice and Kujo with his cool accent. Sound was excellently used throughout the anime. I never once got bored of the characters throughout the anime. Each case presented new characters which kept the anime fresh and alive. I loved Victorique since she was so cute and small! Also she has a tsundere attitude which evidently grows as you watch throughout the anime. Although her attitude does change in the end. Kudos to Kujo for sticking with her to the end. Also, Inspector Blois with his weird hair style never ceases to amuse me. There is a reason for that. You have to watch to find out. Overall, I loved watching this anime from start to finish. Every episode just captivated me and kept me wanting more. I haven't had a single anime do this to me for a while now. The story was well told and the cases had logical conclusions. The art was beautiful and I loved the characters. I never got bored in the end. It's a definitely a must-watch anime for detective, thriller fans out there. Well told with many cases for you to solve. Smoothly transitioned from one episode to the next. Just so beautiful, the places and characters. Really well done. Catchy theme songs and good voice acting makes this that much more interesting to watch. There were many characters to keep the story going and you will never get bored of Victorique and Kujo. Loved each episode. I just wished they extended the ending just a bit more to tell a proper ending to it. Maybe its just me but I felt I needed more! Really well compiled anime. Loved it from start to finish.